The seasoning dampened down the crunch slightly. There was still the sharp, crack and crumble of most of Kettle’s offerings, but there were no sharp edges. Kettle Chips never disappoint with their texture. These were thick and meaty with loads of oil blisters. There was a gentle coating of darkish orange/red seasoning and most of the bag’s contents were whole. A Nose Plunge Test revealed a rather muted aroma, somewhat akin to Beef, but perhaps the flavour description on the bag led us down that route. The flavour certainly featured Red Wine. This may have overwhelmed the Shallot aspect of the flavour because there was nothing particularly oniony about it. There was a meaty backdrop which was nearer to beef than any other meat, but it still wasn’t particularly evident. 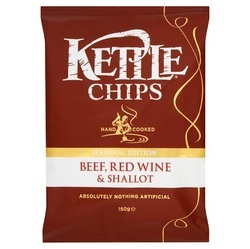 As this was a seasonal Crisp, it may have just been better to go with red Wine Flavour and be done with it, but that’s just this reviewer’s opinion.